Welcome to the Open House party! Thank you to everyone that joined the party last week. So many great links made it hard to choose just a few to feature. I am always in awe of your creativity and talent! If your post is featured feel free to display my party button. into such a cute place to do laundry. 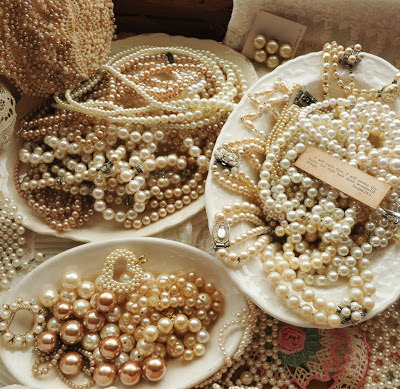 Have you ever seen a more beautiful collection of pearls? Check out Faith, Grace, Crafts to see more beautiful vignettes using pearls and lace. If you haven’t tried Biscoff Spread you are missing out! 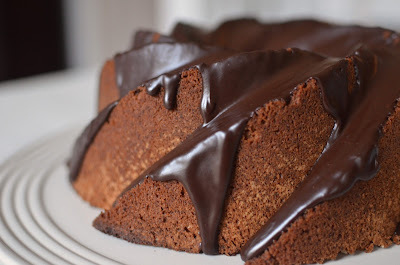 The recipe for Biscoff Bundt Cake with Espresso Ganache was shared by ButterYum. I may have found my newest addiction. Our Southern Home shared her husband’s home office and the changes to the mantle. Just look at the wonderful equestrian tiles and beautiful wood paneling. * I have been bombarded with SPAM and I have comment moderation activated. Thank you so much Sherry for featuring the revamped laundry room that Jordan and I put together at her house. We really appreciate it. I've been bombarded with spam comments lately too! It seems like it started January 1st. Thanks for hosting the party. Thanks for hosting Sherry, have a great week! Thanks for the invitation again this week. Must get organised and blog hop more: was enjoying it a lot. Great features! That cake looks fantastic. Thanks for hosting! I, too, am being bombarded with spam. Hi Sherry. Lots of good features. Susan from BNOTP suggested setting up 2-step verification on google to help with spam (which I did). Thanks for hosting! Thanks so much for hosting Sherry! Yes, so many creative posts! Thanks for hosting. Wonderful features Sherry…thank you so much for hosting. Have a super week! I'm having the same spammer problem and was wondering what was the best way to go. None of the options seems that great. Ah well. Thanks for hosting the party. Looks like a great group! Can't wait to try that decadent Bundt cake and ganache! Great new links, too. Thanks for hosting! I have been working on the laundry room myself. Cute ideas to help inspire me. 🙂 Thanks for hosting. You are super! oh yum, that cake looks heavenly. just linked up, thanks for having us, Sherry! Thank you so much for hosting! Love the gorgeous features. I've been hit hard with spam, too! Hope you are having a great week. Thanks Sherry for hosting…now I am off to visit around. Sherry, thanks for hosting…I turned off my anonymous feature due to the insane amount of spam, too! Thanks for hosting such a great party each week!!! Hi, Sherry! So glad to be partying with you this week! Thank you! Thanks for hosting Sherry, hope you are doing well! Such wonderful features. 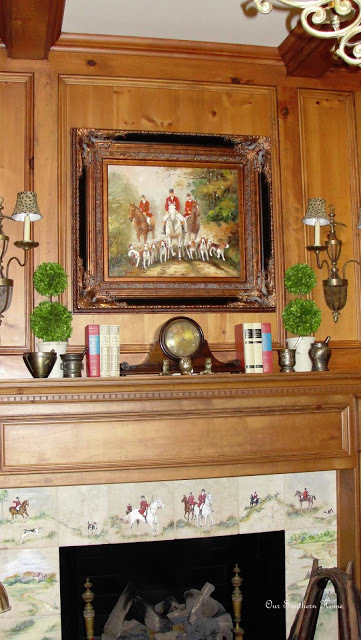 Really like the equestrian themed room. Thanks for hosting each week. Hello Sherry! Thank you so much for featuring my post from last week:s party! How cool of you to do so! And thank you for always hosting such a wonderful link party. I spend so much time checking out the links…I really need to get more housework done!! Thanks for hosting! That collection of pearls is breath-taking! Thank you for hosting Sherry! I am a new follower and new'ish to the blog world. Thanks for having us today, Sherry! Thanks for hosting this party! Am a new follower as well. Thanks so much for hosting Sherry! Have a great weekend! Sherry, that you so much for featuring my husband's study mantle! What an honor to be featured the other wonderful projects! Wonderful party….looking forward to checking them out!! Thanks for hosting! Love a seeing all of the projects! I'm a new follower on GFC! Hi Sherry! Thanks for hosting your fun party for us…I love those features that you selected from last week. Aren't bloggers' photographs getting just like magazine shoots…I'm super impressed! Do you think that Tony Bennett was "playing possum" on the plane? I am so glad I found your site! I am your newest follower!!! might have to link in soon!